How much does it cost to jump at Air U? What are Air U Hours of Operation? Can we just show up and jump? Yes, walk-ins are welcome. 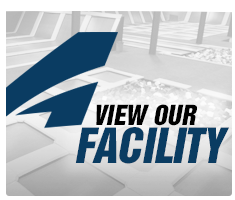 The facility has a maximum number of jumpers that can be allowed to jump at one time, but if there are openings, you can just walk in. Jump times start at the top and bottom of each hour, so please plan to arrive 10-15 minutes before then. 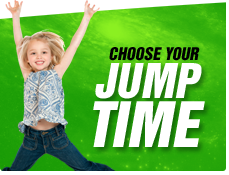 You may reserve jump times or make a party reservation online. Special offers, group discounts and special arrangements must be made by calling the front desk or dropping by. Who has to sign a waiver? How much is a Birthday Party? Want to book one of our party terminals, but pay for individual flight tickets at the door? This is the package for you! This package does NOT include any jump tickets or complimentary t-shirt. Each flight ticket will cost $12. * Each party guest wanting to jump will be required to have a signed waiver and pay the applicable rate for their wristband. You may pickup invitations/waivers from the Air U front desk after your reservation is confirmed. Non-slip trampoline socks are required for all jumpers. You may bring a pair of non-slip, trampoline socks if you already own them or new pairs can be purchased at the front desk for $2. Need more jumpers? No problem, just add $12 for each additional jumper. *All jumpers will need a waiver to join in on the fun. Be sure to pick up your invitations / waivers from the Air U front desk after making your reservation. Non-slip, trampoline socks are required for all jumpers. You may bring a pair of non-slip, trampoline socks if you already own them or new pairs can be purchased at the front desk for $2. 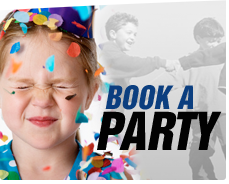 Are birthday party reservations refundable? Birthday party resrervations are non-refundable. When you book a birthday party at Air U, you are reserving a party room and time slot that become unavailable for anyone else to book. Air U also schedules its staff according to the parties that are booked. In order to provide the best service possible to our customers, we do not typically offer refunds for parties that are cancelled. We will always work with our valued guests if unexpected events arise and rescheduling becomes necessary for the customer. Do you offer group discounts for large groups? 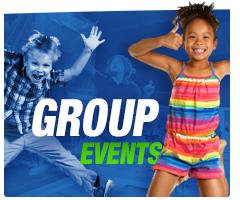 Group discounts are available for groups of 20 or more. Please call 903.663.2478 if you have more questions or if you are interested in bringing a large group during non-business hours. Yes, active and veteran military receive a 10% discount along with active law enforcement officers. Please show your valid military or law enforcement ID when checking in to receive the discount. Will we have to share the trampoline or party room with anyone else? One of the great benefits of Air U is that you have your own party room with a dedicated party Flight Attendant. However, part of the fun is flying with all the other guests and playing in large dodgeball games! We ask that you and your guests arrive 15 minutes prior to your scheduled starting time to allow for check in and to fill out the waiver if you haven’t already done so. Please try not to arrive earlier than 20 minutes prior to the party time, as there will likely be another group in the room. The birthday parents are required to stay at the party. Other adults are also welcome to stay and enjoy the fun! Are socks and shoes allowed? For guest safety and enjoyment, all guest are required to wear approved trampoline socks. You may bring a pair if you already own them or new pairs can be purchased for $2. Are trampoline socks required to jump? YES. All jumpers will be required to wear trampoline socks. Trampoline socks are available for purchase at the front desk for $2 or you can bring your own pair. Will Air U provide supervision on the trampolines? Our fun and friendly Flight Safety Attendants will provide supervision in each of the trampoline areas. Keeping all flights safe and enjoyable is their main purpose. Can we start the party in the party room? Because we’ve found that full tummies and jumping don’t mix, our parties begin on the trampolines. If I signed a waiver once do I need to sign one again? Liability waivers are good for one year. May I bring outside food into Air U? With the exception of party reservations, outside food and/or drinks are not allowed inside the Air U facility. There is a water fountain and a concession stand in the facility that offers a variety of food and drinks. Any other questions concerning food at Air U should be directed to the Air U front desk attendant. People who have booked a party at Air U are welcome to bring in cake, drinks (non-alcholic), pizza, etc. These food items must be kept in the reserved party area. How do I get the party invitations? The invitations are available for you to pick up at the front desk. Someone will be on hand to help you most any time after 9am. Are the parties limited to the number of jumpers specified? When you book a party, we will reserve the number of jumper wristbands that you specify which guarantees access for that many people. If you have more people attend your party, we will allow you to purchase additional wristbands if the park is not full at that time.